Burnley's Charlie Austin equalled Ray Pointer's club record after netting in his eighth consecutive appearance against Bristol City on Tuesday. Pointer achieved the same feat for the Clarets during the 1958-59 season. "I knew about the record," Austin told BBC Radio Lancashire. "Everyone was going on about it but I was confident. "Every time I go forward, I look like I'm going to score and I did. Most importantly, it was massive for us to get the three points." Austin, 23, has now scored 18 times in 14 games this season and has only failed to score in two of those appearances. Burnley made it two victories from two games under caretaker boss Terry Pashley, although they did it the hard way at Ashton Gate. They lived up to their tag as the Championship's entertainers, racing into a 3-1 lead, only to be pegged back to 3-3 in stoppage time. But Chris McCann's header in the 96th minute made it back-to-back league wins for the first time since April. 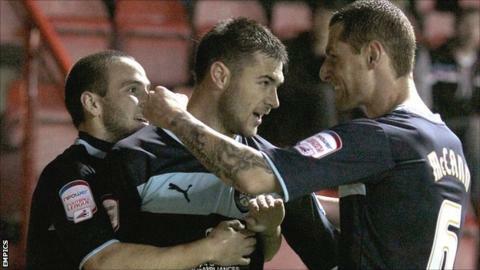 "It was the same old Burnley," joked former Swindon striker Austin. "I think we'll end up conceding 100 and scoring 120 this year. "At 3-1 we looked comfortable, but one mistake and they scored and the momentum took them to 3-3. But we've pushed on and it was a great header from Chris [to win the game]." Burnley have said they are hopeful of appointing a successor to Eddie Howe by the end of the week, with the club confirming they have narrowed their search to three or four candidates. Austin has praised the impact that Pashley, the youth team coach at Turf Moor, has made since taking charge of first-team affairs. "We've had two good results and it's been good [working under Pashley]," said Austin. "He's well liked around the club and it's been great working with him. "Like 'Pash' has told us, if he knows anything, he'll tell us. At the moment, no one knows anything. "The only things we can affect are what goes on the pitch and the training ground."